Helen Keller, was an American author, political activist, and lecturer. She was the first deaf blind person to earn a Bachelor of Arts degree. When Helen was 19 months old, she became extremely ill and lost both her vision and hearing. At age 7, her parents hired a teacher named Anne Sullivan. Miss Sullivan herself had been blind, but had an operation and regained her sight -- so she understood exactly what Helen was feeling. Anne Sullivan, broke through the isolation imposed by a near complete lack of language, allowing Helen to blossom as she learned to communicate. She taught Helen the signs for the letters of the alphabet. Then she would "spell" the words in Helen's hand to communicate with her. 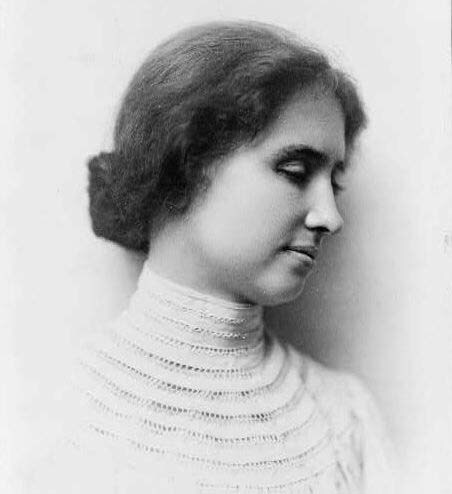 Helen Keller learned to speak when she was ten by feeling her teacher's mouth when she talked. Be of good cheer. Do not think of today's failures, but of the success that may come tomorrow. You have set yourself a difficult task, but you will succeed if you persevere; and you will find a joy in overcoming obstacles. Many people know so little about what is beyond their short range of experience. They look within themselves - and find nothing! Therefore they conclude that there is nothing outside themselves either.